Over one third of the country will see accumulating snow with this system. The potential for a foot of snow is very high in areas where heavy snow bands set up. 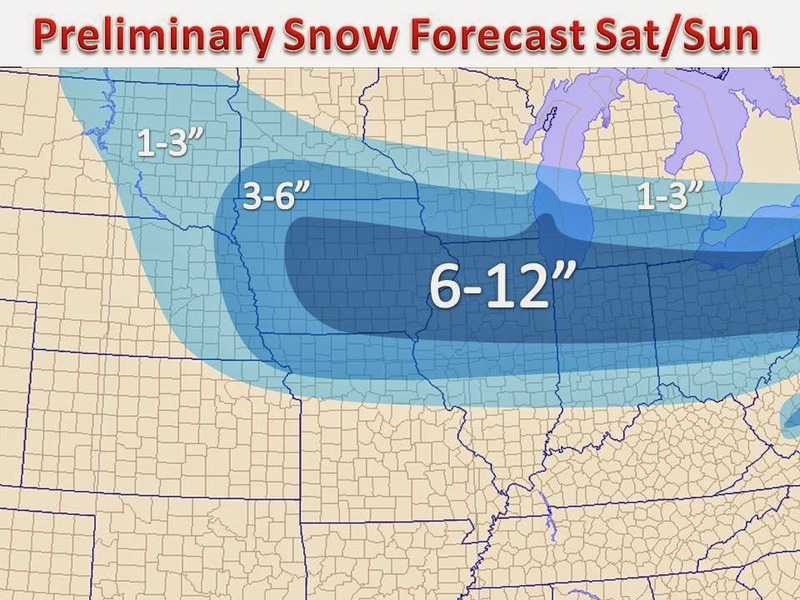 Our official snow forecast is mapped for you above, notice the wide area of over a half foot of snow, right through the populated areas of the Midwest. Confidence is very high with the system, but the exact track and location of heaviest snow is still somewhat in question, but one thing is for sure, a lot of snow is on the way. The trend has been to shift the band north, but how far north? We will be watching as the latest data comes into our forecast center. The system is now on shore and can now be sampled by the rich observation network over land. This will likely be the largest and highest impact winter storm of the season, just in time for Super Bowl weekend. Let's dive into why we are so confident this storm will drop heavy snow to a wide area. The map attached is off the NCEP 12z GFS model, showing relative humidity, moisture for our purpose. This cyclone will emerge from the dessert southwest, but is tapping into Pacific moisture AND Gulf of Mexico moisture. Meanwhile, another shortwave system will dive south from Canada and merge over the central part of the country Sunday. With three distinct areas of moisture crashing together at the same time, it is no wonder why snow amounts could top a foot in many locations. With many systems, similar to this one, dry air to the north is usually fighting up against moisture air from the south, however with the secondary area of low pressure coming in from Canada, this will not be a problem this time around. We are very confident in the amounts forecasted above (could be even higher), but be sure to keep it here if anything changes, we will likely have small tweaks to the forecast as the latest data comes in. Be sure to 'like' our Facebook page for continued updates, there is a 'like box' on the right for your convenience. Warm and January Thaw on the Way!